It never fails, we hear it a lot. Your child is starting to outgrow that new pair of skates you bought for him or her in August, with full hopes of them lasting an entire hockey season. Despite frequent toe nail trims, your little one is complaining that his or her feet are cramped, squished and hurting in the skates. Don't fret - your child may not need a new pair of skates mid-season. Not only is buying a new pair of skates costly, but it also may impact your child's skating if the new skates have a different profile, blade height, boot shape, forward flex, pitch, holder, etc. The list of variables goes on and on. 1. First, we verify that the skate is getting snug - sometimes a player just wants new skates because a friend got a pair, or an unrelated problem is causing the sensation of the skate being too small. We have ways of verifying. 2. We mark areas on the skate that are causing discomfort. Based on these markings, we decide whether it is best to spot-punch "hot-spot" areas on the boot (more on this in another Blog post), or stretch the entire boot. CUSTOM EDGE is able to increase both the length AND/OR width of a hockey or figure skating boot. 3. We carefully heat the boot in our specially-designed skate oven or using a heat gun. This allows the skate material to become pliable and easier to manipulate. 4. We place the skate on our boot stretcher or boot punch and manually apply pressure from within the skate boot using an assortment of "mandrels" chosen to remedy the problem. This creates additional space within the skate boot to accommodate the player's foot or an abnormality/deformity that may cause discomfort. If a skate is stretched for length and/or width, we need to leave it on the stretching device for a minimum of 8 hours, preferably over night. This allows the skate to fully cool with the full pressure applied and offers the best results for maintaining the stretched shape. We also recommend not skating on the skate for a period of up to 12 hours to allow the glues inside the boot to cure. If we spot-punch a skate, we typically do not require the skate for more than a few hours, and the skate can be used the same day, or as soon as it cools down. In some cases, the exterior of the skate may show signs of expansion or stretching, but if done correctly, this does not compromise the integrity or protection of the skate. For you adult skaters, we are able to stretch, widen and spot-punch your skates too. We realize that skates sometimes feel differently in the store or your feet flatten out over time (especially after wearing sandals all summer). 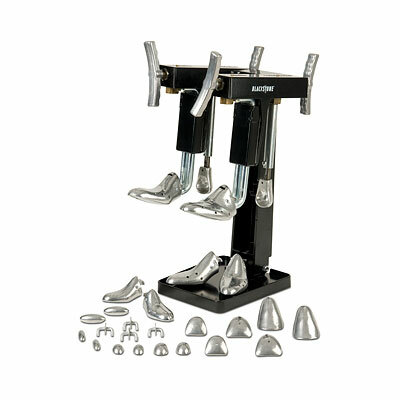 We can work with you to get the most comfort out of your skates too. Remember that proper skate sizing is the single most important aspect of purchasing skates. We can always create a little bit more room in a pair of skates that are too tight or causing pain, but nothing can be done with a pair of skates that are too large. We are also unable to undo stretching or punching, so we try to only use these methods after we have exhausted other various options. If you are interested in any of our skate stretching services or would like to discuss further, please drop by the shop or contact us for more information. We recommend appointments for skate stretching. In most cases we are able to do spot punching while you wait (depending on workload and complexity of work required).